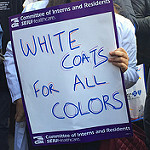 The Committee of Interns and Residents (CIR) is the largest housestaff union in the United States. We are a local of Service Employees International Union (SEIU), representing over 15,000 resident physicians and fellows who are dedicated to improving residency training and education, advancing patient care, and expanding healthcare access for our communities. We empower our nation’s interns, residents and fellows to fight for excellence for our patients, our training and our healthcare system through organizing, collective bargaining and advocacy. CIR is a democratically run organization composed of interns, residents, and fellows from all member hospitals. It is governed by the Executive Committee and the House of Delegates, which are composed of members who are elected annually by their peers.